DUI is a criminal offense in Maryland. Have you been arrested for DUI or DWI for the first time? Have you been charged with DUI or DWI in Maryland for the 2nd, 3rd, 4th or more times? Whether you are facing first offense DUI or multiple offense DUI charges, Allan Rombro has 30 years of experience, extensive knowledge of DUI science and the complex MD DUI and DWI laws along with a superior track record winning DUI cases in every jurisdiction and courtroom in Maryland. Allan Rombro is recognized as a leader in the area of DUI and DWI Defense by his industry with numerous awards for excellence in DUI /DWI Defense. 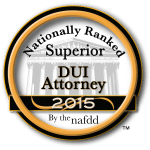 In October 2016 and for the second year in a row, Allan Rombro has earned the prestigious Top 100 DUI Attorneys Award and is Nationally Ranked by the National Association for DUI Defense (NAFDD). Whether this is your 1st, 2nd, 3rd or 4th DUI, Allan Rombro will obtain the best possible result on your drunk driving case. He has successfully defended thousands of DUI and DWI cases in every courtroom in Maryland for over thirty years. If you are a Maryland resident and have a Maryland license, there are important deadlines to protect your license. Call Allan Rombro immediately for a free consultation and case review. If you live OUT OF STATE and got a DUI or DWI in Maryland, there are other special conditions which include deadlines. Email allan@rombrolegal.com or call 410-580-9500 immediately to ensure you protect your out of state license. A DUI or DWI conviction can harm your employment options, driving privilege and your future. Some judges will even sentence jail-time for a first offense. Drunk Driving charges do not have to ruin your life. A powerful, effective DUI defense is essential and will make the difference in your criminal case as well as the MVA case. Always check the DUI Track Record before hiring a DUI Lawyer. The Field Sobriety Tests (FST) are administered at the time of your arrest unless you refuse. There are many reasons why refusing to take FTS, including a variety of medical conditions, medications or even the physical or weather related conditions at the site of your stop. Most people don’t know and the police, unfortunately, will not advise you, but you have the right to speak with a Maryland DUI Lawyer before you decide whether or not take a breath test. It’s up to you to tell the police officer that you desire to speak with a Maryland DUI Attorney BEFORE you take this test. You will be subsequently taken to the police station where officers will ask you to take an official breathalyzer test. The results of this test ARE admissable. If you refuse this test, that is also admissible. As with the preliminary breath test, the official breathalyzer test is also one you have the right to a brief delay to allow you to speak with a competent Maryland DUI Lawyer. Maryland had just passed Noah’s Law making penalties harsher for those convicted of DUI. Here you can read the new Bill from the 2016 Legislative Session. Allan Rombro can explain what this means and how this new law impacts your DUI or DWI case. Call 410-580-9500 now. This bill substantially alters and strengthens Maryland’s DWI/DUI and Ignition Interlock laws, by increasing both judicial and administrative penalties, requiring longer periods of suspension and/or participation in the Ignition Interlock Program (“IIP”), and by applying penalties to more alcohol offenders. All individuals convicted of a violation of § 21-902(a), driving while under the influence of alcohol (DUI), will be required to participate in the Ignition Interlock Program – 6 months for a first violation, 1 year for a second, and 3 years for a third or subsequent violation. Driver’s license suspensions for per se alcohol violations (a breath alcohol concentration (BAC) test result of .08 or higher) will increase to 180 days; suspensions for high BAC violations (a BAC test result of .15 or higher) will increase to 180 days for a first violation and 270 days for a second or subsequent violation; and the suspension periods for a test refusal will increase to 270 days for a first violation and 2 years for a second or subsequent violation. In lieu of a suspension, individuals can opt to participate in the Ignition Interlock Program for 180 days for a BAC test result of .08 or higher or 1 year for either a BAC test result of .15 or higher or a test refusal. The bill has many more provisions, including requiring IIP participation for more individuals, establishing requirements for successful program completion, and establishing certain credit provisions for program participation. It is essential that you hire a lawyer who knows how to win your DUI case. 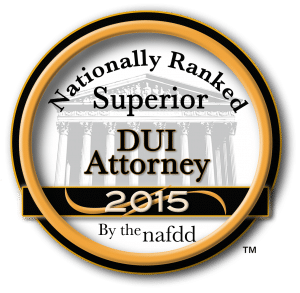 With 30 years experience, Allan Rombro is rated Top 100 DUI Attorneys in a nationally ranked survey by NAFDD. He is rated “Excellent” by Avvo and has a “Distinguished” rating by Martindale Hubbell. Click the links below to see actual reviews posted by his clients directly on Avvo, Facebook and Google Plus. I Highly Recommend Allan Rombro! In 2015, 2016 and 2017 (to date), more than 30% of Allan Rombro’s DUI/DWI clients received Dismissals or reduced charges and over 80% of the remaining clients received Probation before Judgement, including many repeat offenders (one of whom hired our firm to handle his 5th and 6th DUI in February and March 2015). Of the small percentage who were convicted, 100% had numerous prior DUI convictions. In most cases, these clients did not go to jail. Of the several who did, each had five or more prior DUI/DWI convictions. None received more than 30 days and most received less. Allan Rombro is familiar with all jurisdictions, Judges and courtrooms in Maryland and he understands exactly how to prepare a thorough and winning defense to include technical and legal arguments, how to challenge the legality of the police stop, the probable cause for testing field sobriety tests, the correct (or incorrect) administration of those tests and dozens of other requirements necessary for proper breath test administration. In March 2015, in a recorded advice of rights to our client, a State Trooper incorrectly advised our client that the legal limit for impairment in Maryland is .8. In fact, it is .08. Two other lawyers missed this mistake. Allan Rombro did not miss it, and he argued to the judge that incorrect advice is tantamount to no advice. Case Dismissed. This is just one example of the thorough and detail oriented methodology Allan Rombro brings to every single DUI/DWI case. Allan Rombro stays abreast of all scientific and cutting edge DUI technology and defenses. In October 2015, he participated in the National Association for Criminal Defense Lawyers annual conference: DWI (DUI) Means Defend with Ingenuity Seminar held at the Bellagio Hotel in Las Vegas Nevada. As more and more DUI “science” is debunked, lawyers who educate themselves and stay on the cutting edge are much better equipped to win DUI and DWI cases. In 2016 as judges get tougher and sentences harsher, there is also additional scientific evidence available for a number of DUI and DWI technical defenses, including: impact of gastric bypass surgery on breathalyzer result; how hearing impairment affects field sobriety testing; impact of prescription medications on the Field Sobriety Tests (FST); how a past injury or illness can alter the breathalyzer or Field Sobriety Tests and others . Allan Rombro has extensive experience with and knowledge of current science and inquiry and knows how to apply it to challenge the accuracy and/or legitimacy of the breathalyzer test and/or the Field Sobriety Tests (FST). In recent years, attitudes toward driving under the influence, driving while impaired, drunk driving, DUI and DWI have changed. A DUI in Maryland is much more serious than it used to be. Judges now interpret the law more strictly and impose harsher sentences. A first-time offender may even have to spend time in jail. Whether this is your first (1st) DUI, second (2nd) DUI or even your fourth DUI, the right DUI defense is critical to obtaining the best possible result, including acquittal, probation, or entry into a program in lieu of a harsher sentence. Since 1988, the Law Offices of Allan H. Rombro has represented clients charged with Driving Under the Influence, DUI, Driving While Impaired DWI, Drunk Driving, criminal traffic violations and other criminal offenses. We believe in taking an energetic, assertive approach toward the defense of our clients’ rights and freedom. As a DUI defense attorney for almost thirty years, Allan Rombro is well qualified to obtain the best possible result — one that minimizes the penalties you face and minimizes the impact on your life. Call 410-580-9500 or send us an e-mail to arrange for a free consultation. Allan H. Rombro can discuss the legal strategies open to you and provide you with realistic advice. If you have been charged with DUI in Maryland, building a strong DUI defense is critical: we put the client in a stronger position to possibly overcome the charge at trial, obtain a dismissal or reduced penalties. In other cases, the State may have strong evidence. At your direction, we will take actions to minimize the consequences; this may include an alcohol usage evaluation by a certified counselor. It can also provide the basis for obtaining placement in a treatment program in exchange for reduced penalties. A DUI or DWI arrest triggers a process that can cause MVA to issue a suspended license or even a revocation of your driver’s license. To avoid having your license suspended, you must request a Motor Vehicle Administration (MVA) hearing within 10 days of your arrest. Attorney Allan H. Rombro can represent you at this hearing and seek to help you avoid a suspension of your driver’s license or try to obtain a temporary drivers license for you. If you took a breathalyzer test and failed the breathalyzer, it doesn’t necessarily mean you will lose your license or privilege to drive. Often, Allan Rombro can obtain an outcome that includes getting an interlock device on your car or vehicle. This interlock device is often called a blow and go. An arrest for DUI or DWI is serious. The Law Offices of Allan H. Rombro will work to preserve your freedom, keep you on the road and minimize the consequences you face. Don’t let a DUI/Drunk Driving arrest, a DWI arrest, or a Drugged Driving charge impact your future, your ability to get a job, get a loan or qualify for many other types of benefits. If you have an OUT OF STATE DRIVERS LICENSE, this can complicate your case and it is essential that you have an experienced DUI lawyer who handles Maryland DUI for out of state clients routinely. Allan Rombro handles Maryland DUI cases for clients who live in all surrounding states (VA, DC, PA, DE, NY, NJ,) on a very frequent basis and is familiar with the drivers license laws and processes in your home state. He also handles out of state resident cases throughout the US. If you live OUT OF STATE and are charged with DUI or DWI in Maryland, email Allan Rombro directly at allan@www.rombrolegal.com or call 410-580-9500 immediately to ensure your drivers license is protected. Do I have to take a field sobriety test or a breathalyzer test? You cannot be compelled to submit to a field sobriety test or a Breathalyzer test in Maryland. However, by refusing the tests, you will be penalized by the Motor Vehicle Administration (MVA). Refusing to take the breathalyzer automatically results in MVA suspending your drivers license. At your MVA hearing, the rules of evidence and procedure are guided by different Maryland law than what guides your criminal case. This means it is essential to hire a DUI, DWI, drunk driving lawyer with experience winning cases at MVA related to DUI license suspension. There are three standard types of field sobriety tests used in Maryland: the horizontal gaze nystagmus test, the walk-and-turn test, and the one-leg stand test. These tests are designed to help the police decide if a driver is under the influence of drugs or alcohol, and also to test a person’s balance, coordination, memory and ability to follow instructions. Road conditions. Were you tested on a flat well lit surface? Was there oncoming traffic and headlights? Were the police emergency lights blinding your vision? Were you wearing high heels or barefoot? Was there any debris on the test surface? A: If you refuse to take the breathalyzer, your license will be suspended by MVA. When you first obtain your Maryland drivers license, you agree to submit to a breathalyzer if you are arrested for DUI, DWI or drunk driving. Refusal to take a breathalyzer test results in automatic suspension of your Maryland driving privilege and you can lose your drivers license. A: No. You can refuse a field sobriety test. The field sobriety test is a tool used by police, usually at roadside, and designed to provide enough evidence of DUI, DWI or drunk driving. This test is subjective and based on faulty science. Despite this, it is widely accepted as a law enforcement tool. If the police determine that you failed a field sobriety test, that allows them to request that you take a breathalyzer test. Do I have to take the breathalyzer test? A: No. You can refuse a breathalyzer test. The breathalyzer device measures the amount of alcohol in your bloodstream by analyzing the amount of alcohol emitted from your lungs when you blow into the breathalyzer machine. If you blew less than a .05, you cannot be charged with DUI, DWI or drunk driving. If you blow .05-.07, you can be charged with DWI or Driving While Impaired. If you blow a .08 or above, you can be charged with DUI or Driving Under the Influence. What if this is my second DUI? A. 2nd DUI is very serious, but, like a first DUI there may be factors that mitigate your case. Allan Rombro has successfully defended clients charged with a 2nd DUI. A: Yes. If your Maryland drivers license is revoked for refusing to take a breathalyzer test, Allan Rombro will vigorously argue your case to the Office of Administrative Hearings. The OAH hearing can occur before or after your criminal DUI, DWI or drunk driving trial. The best way to get your drivers license reinstated is to win your DUI, DWI or drunk driving case. MVA, however, can still revoke your license even if you win your DUI/DWI or drunk driving case in court. If MVA revokes your license for refusing to take the breathalyzer, Allan Rombro has almost thirty years of experience and will analyze the facts of the initial stop in order to determine if the police followed proper procedure. If the police failed to follow each and every procedural step, it is possible to win your MVA case even if you refused the breathalyzer test.